Good Morning! I hope your week is going well. Time is just flying by, there is a countdown clock on the kids' school website counting down to the first day of school. Hollyanne was checking it out when schedules can be picked up and Levi is ready to get the haircut so it looks good when school starts. LOL I think they are really ready to go back, get back to the routine and amongst their friends. Cute, right?! He's sure having fun flying by in his little plane, playing on the summer wind. So are you ready to play? Head on over. Have a great Thursday. Now, isn't that a sweet teddy bear? I love him paper pieced, so easy to do. And I made my own button again. Man, I am lovin' this embellishment. Easy make, super easy on the budget. I hope to see you over at TMS to play along. Have a great Tuesday! Good Morning! Yay!! 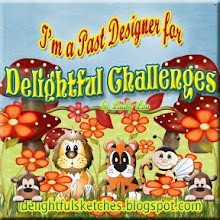 We're on the downhill side of this week and that means a new challenge at Delightful Challenges. It was really amazing to see all the entries for last week's special folds challenge. Wow! This week's challenge is a fun one, too. I had to laugh, I showed my son my card when I finished it and he said "that card is late." LOL I told him it wasn't late, it's early and we're half way to Christmas. So, here's your opportunity to get a jumpstart on your holiday greetings and maybe win a prize, too. This sweet image is called Stocking Noah. I love the faces that Wendy gives her images, they are just so sweet and so loveable. 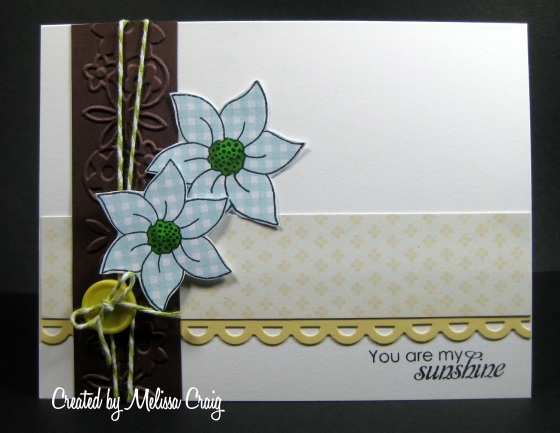 As you can tell, I pulled some oooold paper from Stampin' Up! and I think my Christmas card turned out really well. I hope you think so, too. The layout is from a great sketch over at Let's Capture these Sketches. OK so most of you know me and that I don't watch TV. Well, I have to admit that since moving to FL and having free cable, I sit and watch TV with my kids more than I have in a very long time. Truth is, I work a job that I talk to people all day long and most of them are complaining or arguing or yelling. It's really mentally exhausting which spills over to physical exhaustion. This type of daily activity makes it super easy to just come home, plop down in my favorite chair and just veg in front of the TV. Yep! I actually went to my room to play with some new stamps that I treated myself to. I'll feel bad about them when I get my bill, but for now, it was fun. I just had to have the new stamp kit from Sweet n Sassy. It arrived a week ago and tonight was a perfect night to break it in. Let me tell you, I am totally in love with baker's twine. I'm going to buy all the colors SNSS carries, so that means I need to sell some unused stamps and things. I did also play along with a couple of challenges. 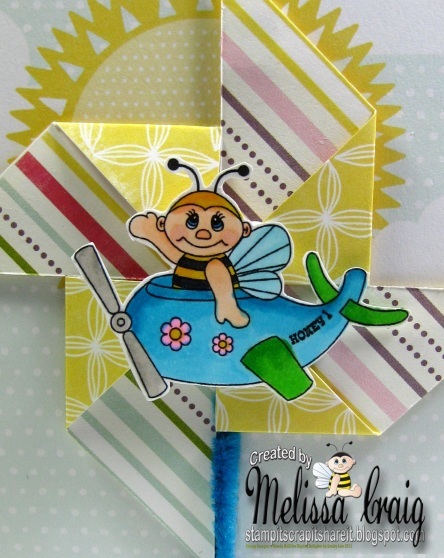 There She Goes has a color challenge: Soft Yellow, Chocolate Brown and Baby Blue. 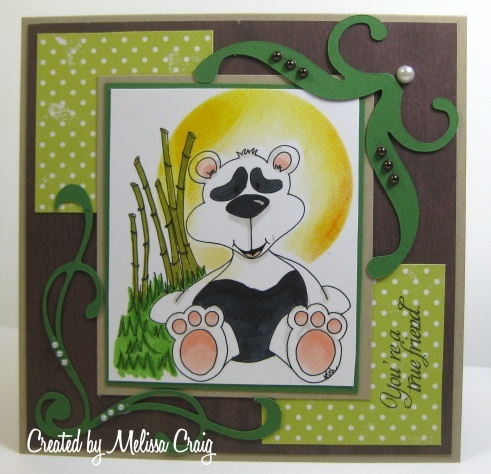 I also used the sketch from Simply Stamping Challenge. I love clean and simple cards. I think even with little embellishment it still fits the definition of CAS. Thank you for visiting me today. I do love your visits. It also means there is a new challenge over at Tuesday Morning Sketches. 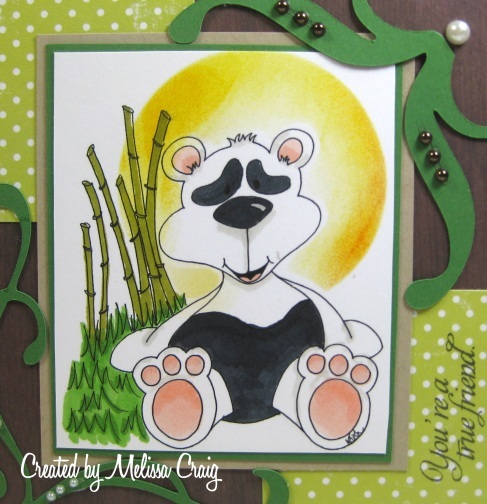 This week's sketch was created by DT Member, Dawn Barghorn. It's a fun and easy sketch and is only limited to your imagination. 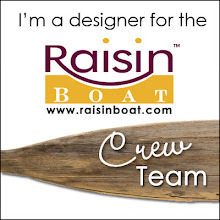 By LORi Design is our sponsor - a new one to TMS. 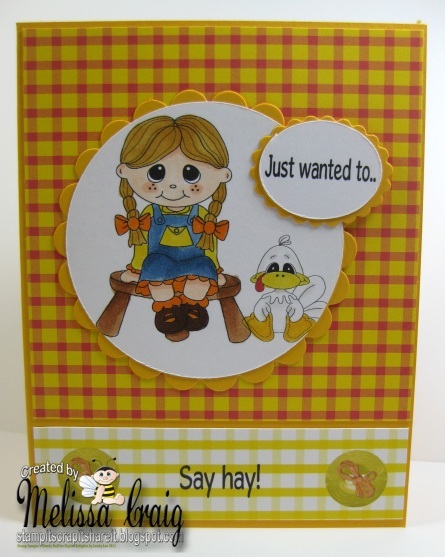 Lori's designs are so sweet and captures the innocence of childhood. Here's my card featuring her adorable image called Watermelon Smile. I kept my card pretty simple. 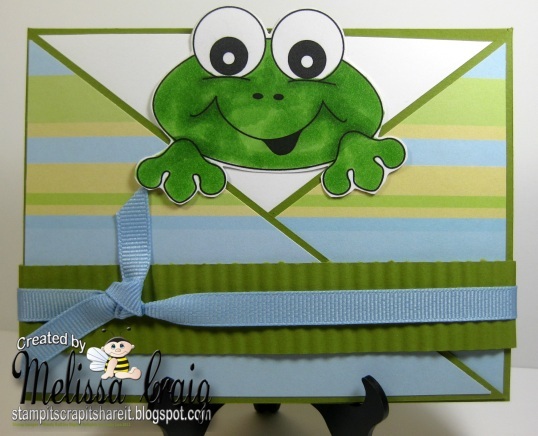 You know that I like to make cards every now and then that are single $0.44 postage stamp cards. This one hits that postal office standard. And yet, still very sweet for a little girl or a little girl at heart. 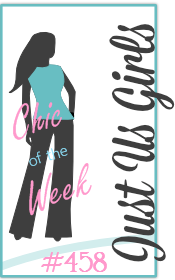 I hope you join us this week over at TMS. Everyone is welcome. Have a super Tuesday! Good Morning! I hope you had a great weekend. Mine was really nice, a bit of a whirlwind and much too short, but that's OK. I have been accepted to the Paper Pretties design team and I am really super excited this. The images are sweet and I've seen a lot of upcoming new releases that I can't wait to share with you each week. These two adorable guys released today. They also have some really great coordinating sentiments. I chose to play with Max Splasher, a sweet little dog that is quite a character. And he helped me with my first scrapbook page in, oh, probably 4 years or more. I know, I know - scrapbooking was why I got into papercrafting and I haven't done it in years!! 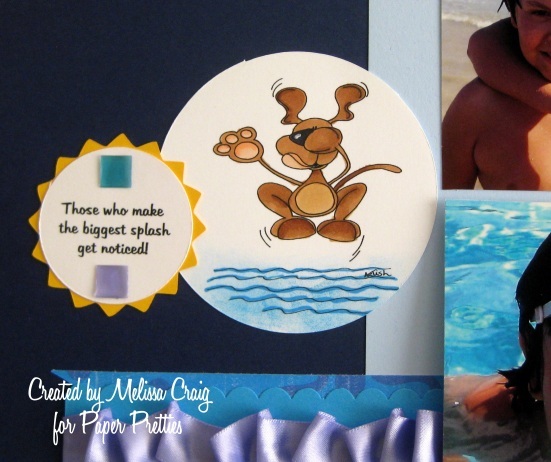 The challenge over at Paper Pretties is Make a Splash - what a great challenge for my summer fun photos. Here you can see Max and one of his coordinating sentiments. 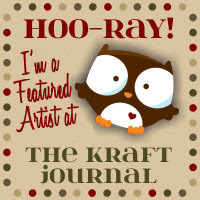 You can also see some of the detail that went into this fabulous layout that I got from Twisted Sketches. The sketch was to add ribbon, any how - any way. I ruffled mine to resemble a wave. Here's the full page. It's not easy photographing a 12 x 12 page. My youngest son hates that I am always taking pictures. Believe me, he's having the time of his life, just sick of me taking pictures so he made this face at me. I hope you join us for the challenge at Paper Pretties and I challenge you even further pick up something you might not have done in awhile - like a scrapbook page. Enjoy your Monday! 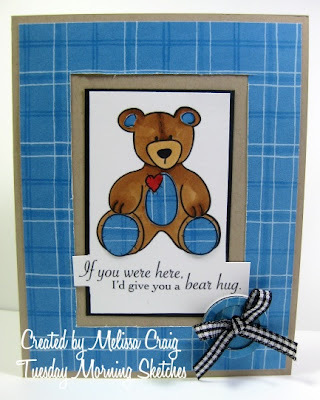 Of course, everyone knows how to create a criss-cross card. This was a lot of fun - I haven't visited this type of fold in a long time. I think it worked really well with this sweet topper image. Pull him out and he's the "inside" of the card, too. I hope you enjoy my card and that you'll join us. Now head on over for some fun and prize details. Enjoy your Thursday! 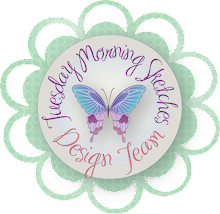 OK - well, it's Tuesday and I have a really super fun challenge for you at Tuesday Morning Sketches. Of course it's the Judged Challenge, so you get to go over the top to create something drop dead gorgeous. 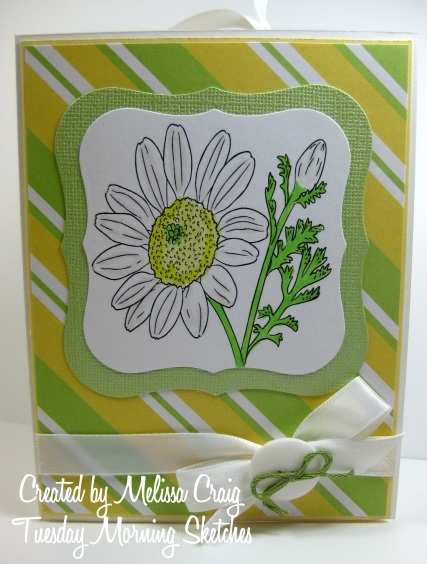 This week's challenge is to create a card with a detachable bookmark. Reading is something that is really important to me and even though there are e-Readers, Kindles, Nooks, apps for the iPhones and Droids there is still nothing like snuggling in your favorite seat with a blanket and a nice glass of wine (or whatever you prefer) and a real book in hand. This is a fun and functional way to say hello to your favorite reader and leave a lasting impression. 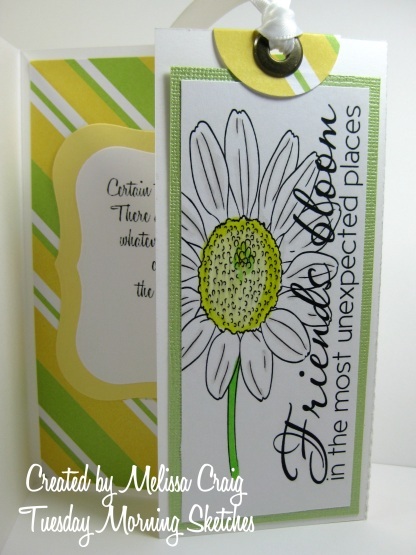 You can find a great tutorial here on SCS for card w/detachable bookmark, but I also found this one on You Tube. So here, you can see when you open up the card, the bookmark is on the flap. It's scored and completely detachable. And then I decorated the inside with a sweet greeting. You, of course, can leave blank to write a personal message. I rarely decorate the insides of my cards and I was loving this one so much, the color combo making me so happy, I just had to keep playing with it. I do hope you'll join us this week. We'll see you there! Good Morning! I hope you're having a great weekend. Mine is going pretty well. I do need to get my rear in gear and go make coffee and start laundry. But before I get to all that, I thought I would make a card to share with everyone. My monthly card traders group challenge this month is to create faux metal frames. I haven't done this technique in YEARS. I'd forgotten how much fun it could be. So today's card is dedicated to all things stashed. What do I mean by that? We all have our papers, supplies, tools and techniques that have been kept over the years but somehow get bypassed. Well, I pulled some of those things out today. First, the faux metal frame. I cut a circle out and embossed it with silver embossing powder. Second, the stamp. This sweet little Swiss Pixie stamp has been sitting in a box for a long time. And thirdly, the brads. I hardly use brads on my cards anymore. I think I've forgotten how to layer things up a bit. 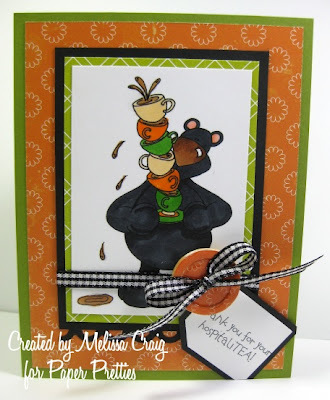 I still feel this card is a bit flat - but cute anyway. 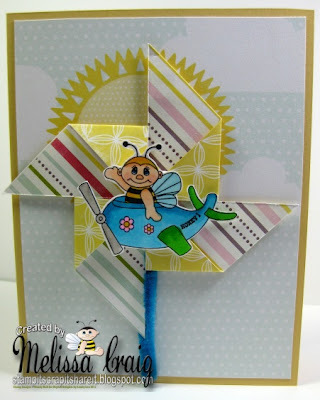 I am also playing along with Sweet Sunday Sketch (the great sketch) and All That Scraps Wednesday Challenge (Anything Goes). Thank you for visiting me. I wish you well. Hello! Have you ever been in a frame of mind that you know what day it is but you're still a day behind? Well, that's how I feel right now. It's 10:30 pm and I'm trying to settle into sleep thinking wonderful thoughts of the weekend and how happy I am with the short week and then it hit me. Today was Thursday! OMG!! I was supposed to post my Digital Delights post today! Yipes!! So to Wendy and my teammates, a huge apology for my brain bubble burst. This week's challenge coincides with the July new release. Down on the Farm released today, which is a colleciton of loveable images. Here is my card. I did use the sketch from Just Us Girls for this layout which ended up being perfect for this fairly simple card. Again, I beg your forgiveness for being such a dumb bunny. Now I feel I can lay my head back down on the pillow and not feel completely stupid. Good night everyone. Please do come back when the post is polished. 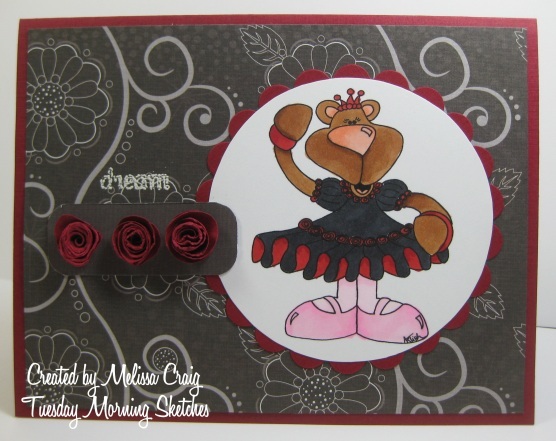 Paper Pretties is sponsoring us this week and I shared a card I made with another one of their adorable images, but I really love this Beriosova Ballerina because she's cute and since my daughter is going into her 7th year of ballet - what's not to love?! One of the dances from recital was called Man of LaMancha. Although I've never seen the musical, I love the music. I had this great new paper in my collection that I wanted to play with, so I went with the red and black combo which were also the gorgeous costumes the dancers wore. I love how this turned out. Right down to the hand-rolled roses and embossed sentiment. Enjoy your day! I hope you decide to join us - there is a really sweet prize available. Good Morning friends. I hope everyone is enjoying their holiday weekend. 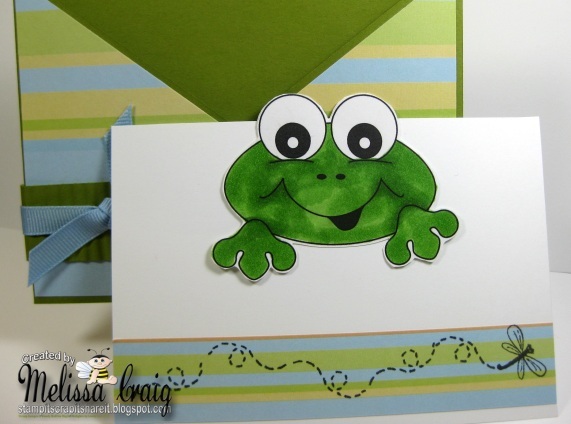 I have had so much fun hanging out with my kids, a few friends and stamping. Can you believe it - I actually got about 6 cards done! That is amazing for me. 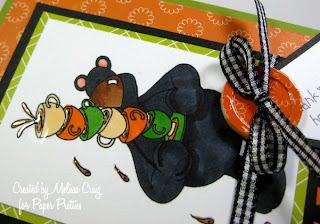 I have a card to share with you that features an adorable image from Paper Pretties, who happens to be sponsoring Tuesday Morning Sketches this week (be sure to check back tomorrow for the sketch). I printed off a couple of images because I wasn't quite sure which one I wanted to use - so I did one for TMS and one because I was just having fun. This adorable panda bear is Pasha Panda. I had so much fun coloring this image, it was so easy! Pasha has so much personality in just that little face, I didn't need to do a whole lot of work. 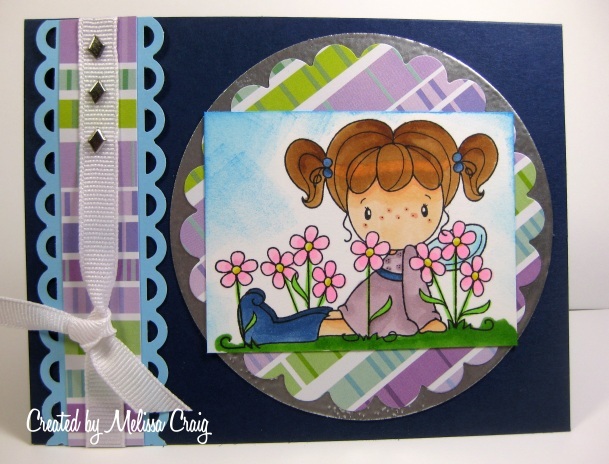 My card's layout came from a great sketch over at Sketch n Stash. Love the sketch. The stash part is paper I haven't used in a long time and the flourishes are from a Cricut cartridge that only stays in my Cricut so I can use SCAL. 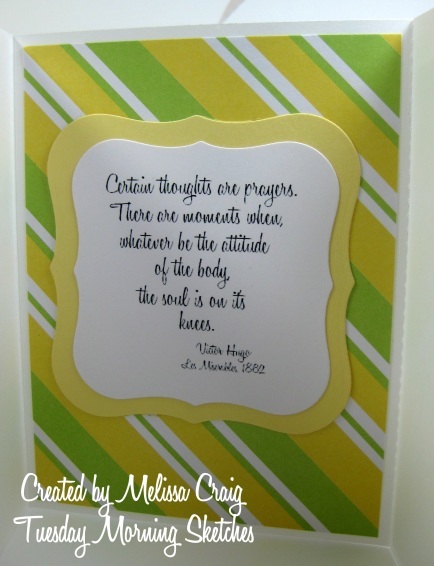 I cut two different types of flourishes which are perfect to play along with Simon Says Stamp and Show challenge. I think my card turned out really great! I hate taking pictures in the daytime though. My craft table faces east so I get lots of bright sunshine in the mornig - its nice, except when taking pictures. I hope my card looks better on your monitor because this one is super cute. Thanks for stopping by! Enjoy your day.